Appropriations Chairwoman Lowey says that the issue of tobacco hangs over FDA’s head. She accused FDA of letting thousands of products hit the market leading to today’s “epidemic,” with a specific mention of JUUL. JUUL’s products were legally on the market on August 8, 2016, the date FDA began regulating vaping products. While the FDA has been, to say the least, lax in their enforcement of their ban on new, post-8/8/2016 products, this cannot be blamed on JUUL. Indeed, JUUL has acted where the FDA has failed, having filed dozens of lawsuits seeking to take illegal copycat products off the market. Research has repeatedly shown that youth tend to vastly overestimate the percentage of their friends and peers who are smoking cigarettes, drinking alcohol, using marijuana, etc. The same is true with vaping products, as one study published last year in Tobacco Control demonstrated. With the data continually showing that this overestimation is very common, the results of nationwide surveys of tens of thousands of youth should be taken more seriously than the anecdotes of individual teenagers. Lowey: “What would it take for the FDA to ban flavors altogether?” Gottlieb indicated that would not be happening right now but said the youth use issue poses an “existential threat” and that “I am willing to pull them off the market” if youth use trends continue. Rep. Aderholt asked Gottlieb about raising federal age to purchase to 21. Gottlieb said he and the FDA agree that would be helpful. Gottlieb said he would be coming out with new guidance for the online verification of legal age to purchase requirements and mentioned signature at delivery, utilized in wine/liquor sales. The people who order wine online are unlikely to be of the same social class or employment situation as those who order vaping products online. We are concerned that requiring ID at delivery would be unnecessarily burdensome, as those with 9 am – 5 pm jobs will be essentially cut off from easy and legal access to online orders. There are better ways to police this activity in this modern technology era, including mandatory FDA registration of online retailers and advanced third-party age verification. Until the the FDA actually cracks down on the illegal sales happening every single day on public forums like eBay, it should not take steps to radically transform online sales of vaping products. Subcommittee Chairman Bishop (of Cole/Bishop notoriety) expressed concerns about the costs to small businesses with complying with FDA rules and Gottlieb conceded that they are cognizant of those costs, without providing a clear answer on how they’re going to address them with pending 2022 PMTA deadlines. Rep. Sanford Bishop (D-GA) is a true champion of small businesses in his district. We are hopeful he will continue to press Gottlieb about the need to provide a pathway for small- and medium-sized businesses to remain open. Rep. DeLauro spoke angrily about Altria and JUUL, claiming there are “no rules” or “oversight” of e-cigarettes. She went on to explain that e-cigarette companies are making modified risk claims without FDA approval. Her example? Companies like Altria and JUUL have quoted Gottlieb’s remarks on the potential harm reduction benefits of adults switching from cigarettes to e-cigarettes. Neither Altria nor JUUL quotes Commissioner Gottlieb on any material designed to sell vaping products. Consistent with the First Amendment, companies are permitted to quote government officials when communicating with the public about their company and their mission. “There are radio ads about harm reduction!” Rep. DeLauro proclaimed. Rep. DeLauro is likely referencing radio ads JUUL has been running that highlight the company’s mission of eliminating combustible cigarettes and stories of smokers that have switched to JUUL. Nothing in these ads violate the law and product ads come with a federally-mandated warning that JUUL contains nicotine. It is clear that for some members of Congress, any advertising by JUUL is unacceptable. Over at Reason, Jacob Sullum highlights some key findings from a new clinical trial commissioned by JUUL Labs. The trial looked at reductions in key cigarette-related biomarkers that the FDA has identified as important in documenting the potential health effects of a tobacco or nicotine product. Below you can read the press release from JUUL. 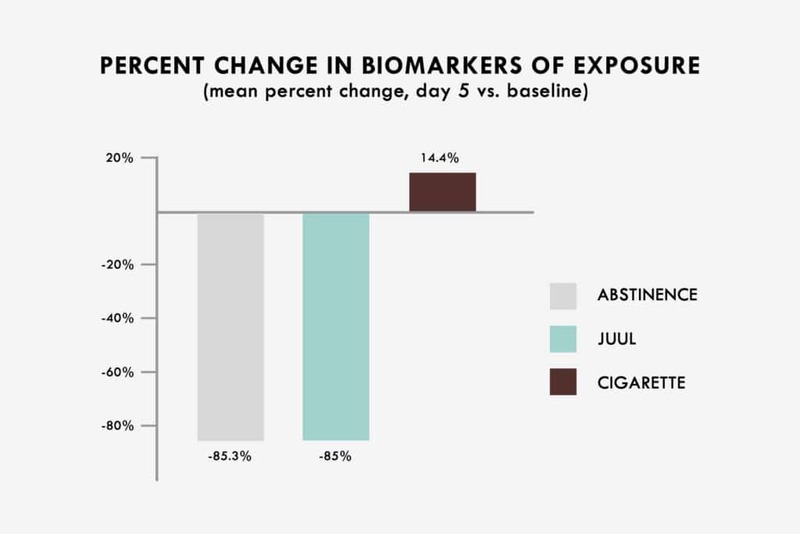 JUUL Labs today announced results from a clinical study which found equivalent reductions in select short-term biomarkers of exposure (BOE) between adult smokers who exclusively switched to JUUL products and those who abstained from smoking over a five-day period. Results from the study, “Changes in Biomarkers of Exposure Associated with Switching for 5 Days from Combusted Cigarettes to Nicotine Salt Pod System,” were presented at the U.S. Society for Research on Nicotine & Tobacco (SRNT) 2019 Annual Meeting in San Francisco, CA. The study, a randomized, open‑label, parallel‑group, inpatient study of adult smokers, was sponsored by JUUL Labs and conducted by Celerion, Inc., a third-party research laboratory. It examined changes, relative to baseline, in primary urine and blood BOEs in 90 adult smokers. The selected short-term biomarkers, NNN, NNAL, 3-HPMA, MHBMA, S-PMA, HMPMA, CEMA, 1-OHP, and COHb, are carcinogens observed in the use of combustible cigarettes, and are widely recognized as contributing to tobacco-related cancers. Study subjects were randomized into six groups and, over five days, used a nicotine salt pod system (NSPS/JUULpod), abstained from smoking, or continued use of their usual brand of cigarettes. NSPS users were further randomized into four distinct groups (15 subjects per group), and used one of four flavored products at 5% nicotine strength (Virginia Tobacco, Mint, Mango, or Creme). Before the baseline reading, subjects abstained from smoking for 12 hours to assess the BOE impact from NSPS use, abstinence, or cigarette consumption. The study found that all eight non-nicotine urine BOEs were reduced by an aggregate of 85.3% in the abstinence group compared to an 85.0% aggregate reduction in the pooled NSPS group (p > 0.05). This represents a 99.6% relative reduction in aggregate BOEs for the pooled NSPS group. In the cigarette group, the same BOEs increased by an aggregate of 14.4% from baseline. Consistent with FDA regulations, JUUL Labs cannot and does not make any claims that its products are less harmful or safer than cigarettes. For more information on the data presented at SRNT 2019, please visit jliscience.com. Dr. Brad Rodu talks about the factors driving a dramatic decrease in cigarette smoking with radio host Rob Schilling on The Schilling Show/WINA Charlottesville, VA.
Dr. Brad Rodu is a man on a mission: to save the millions of lives currently at risk from smoking cigarettes. While a quitting is a formidable challenge for many smokers, Dr. Rodu’s answer is simple: If you can’t fight the urge to smoke, then switch completely to a safer delivery system to get your nicotine. Whether it’s e-cigarettes or smokeless tobacco products such as dip and chew or Swedish snus, there are myriad ways to achieve a successful segue from cigarettes – if these products remain to be had. And there is a host of government and institutional forces allied to make sure there is diminishing availability for all. It is an understandable but misguided zero-sum take-no-prisoners effort to prevent youth from using these products and to prevent another generation of nicotine users. In the meantime, adult smokers are dying or sealing their fate by remaining smokers because the truth about safer nicotine delivery products is withheld by tobacco prohibitionists guiding tobacco policy in NGO health organizations and government/public health institutions. The CDC reports historic record lows on smoking. One of the reasons, Dr. Rodu notes, is that smokers are switching to smoke-free non-combustible products. Vaping products and smokeless tobaccos such as Swedish snus should be readily available to adults and through age and retail restrictions and sensible regulatory control of safety and quality. For this reason, Dr. Rodu is an advocate of Tobacco 21, as posted recently on his blog rodutobaccotruth.com. Those already in the know or who want to be educated on the issues of Tobacco Harm Reduction turn regularly to Rodutobaccotruth.com where he parses and analyzes the false statements and faulty science promoted and practiced by many in the anti-tobacco camps. The US public health debate over safer alternatives to cigarettes – e-cigarettes, Swedish snus and other non-combustible products – is explored by public health physician Dr. Joel Nitzkin and host Jim Engster on his show Talk Louisiana for WRKF-FM Baton Rouge, an NPR affiliate station. The discussion includes youth uptake of e-cigarettes, differential tobacco taxes, and non-combustibles as an effective cessation strategy for adult smokers. Dr. Joel L. Nitzkin, senior fellow in tobacco policy for the R Street Institute, is a public health physician, board certified in preventive medicine as his medical specialty. He has been a local health director, a state health director and president of two national public health organizations. Since the mid-1990s, Joel has been in the private practice of public health as a health policy consultant. In this capacity, he has taken on a number of research and teaching assignments for federal, state and local public health agencies; assisted with accreditation of a managed care organization; and done substantial expert witness work related to communicable disease control, quality of health care, and tobacco control.